If your DC power jack is having an intermittent connection or not working at all anymore, don't throw away your Laptop/ notebook ...Don't order a new motherboard for a lot of $$$$ either. This service can restore your Laptop notebook or tablet PC back to proper functionality for a fraction of the price. The battery is not charging properly or stays at half charge despite that you have been using the power adapter. The screen flickers (the brightness is changing) while the power cord is plugged in. This is caused by the laptop switching between DC power (screen is brighter) and battery power (screen is dimmer). The DC plug gets hot after a few minutes of use and may even smell of burning. There are “scratching” sounds coming from the DC jack. Please call us for a free estimate for the Manufacturer's original laptop Power Jack Replacement for your laptop. 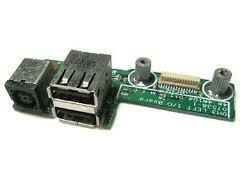 We replace laptop Power Jack Replacement on the spot the same day service. This is a Brand New Laptop DC Power Jack.